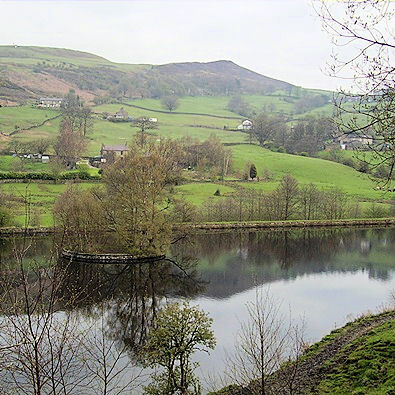 Summary: Tuesday 24th April 2012 was the 80th anniversary of the Kinder Mass Trespass. Ken wanted to do a little something to mark the event and show support and appreciation for those campaigners who started the move towards our 'Right to Roam'. 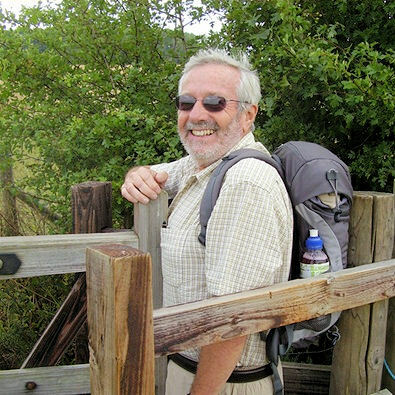 He takes a look at the 'Trespass Trail' and finds more along the way than just footpath history. 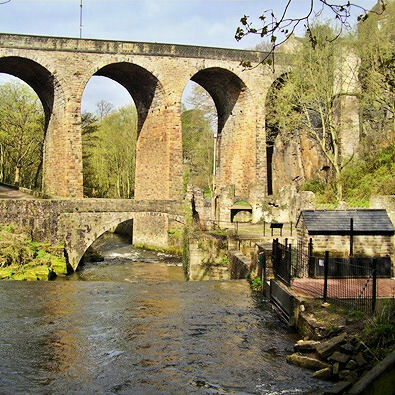 The Trail guide is available to download at http://kindertrespass.com/index.asp free and starts at New Mills. Hayfield was a little less car travel for me so I started there and did not regret my amendment. Hayfield is a very pleasant little town with shops and services to serve forgotten items of kit or refreshments on my return. The streets were busy with pupils making their way to school and college as the church clock struck 8.15am. The car park at the start of the Sett Valley Way was once the railway station where ramblers would have arrived from Manchester for a day in the country. 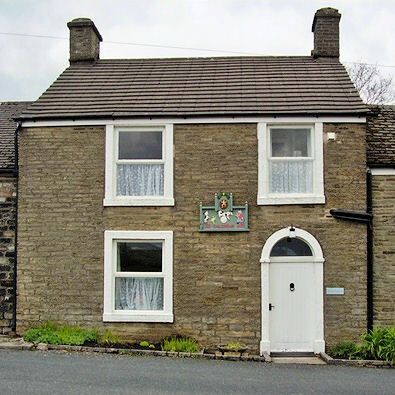 Many of the businesses in Hayfield must have profited from this tourist trade. 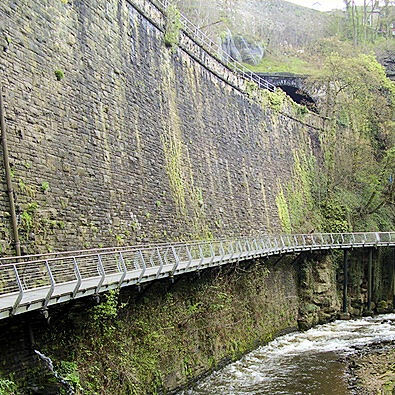 I often find these railway trails a bit of a drag but there's lots of interest here so before I know it I am entering New Mills. 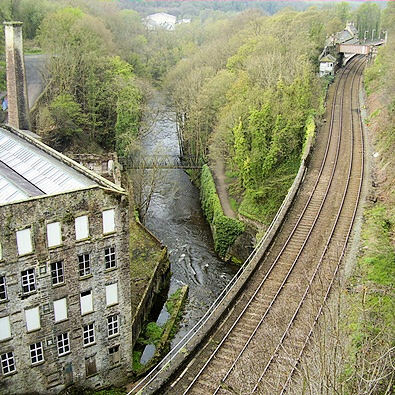 I fell in love with New Mills on my first visit. 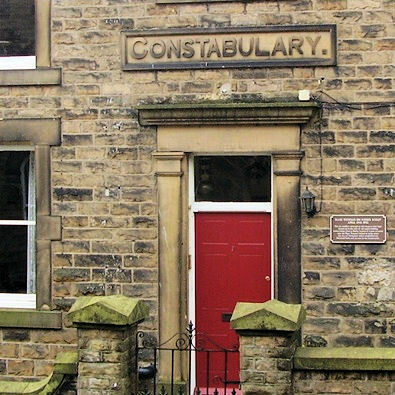 As the name suggests this is an industrial town but for me most old northern industry has charm and here it oozes from every street, ginnel and building. The trail carefully leads me to the Town Hall now home to the Town Council where the criminal proceedings were started. I wandered around to view the sights then sat on a bench to eat breakfast. This walk has lots for the eyes to feast on and also for the mind to ponder. The view across the valley was good but I started thinking how things have changed in those eighty years. Or have they? I suddenly recalled my efforts to improve our local paths. Out walking one evening I met a farmer, gun at his side perhaps after a few rabbits. He was leaning on the gate he had kept padlocked until I had arranged for a stile to be installed alongside. As I climbed the new stile the farmer said "don't you worry about getting shot?". I wonder if he recalls that off the cuff comment which I will never forget. Getting ready to move off I drop a few crumbs from my food and look around for CCTV hoping I won't be accused of dropping litter. In addition to a plaque recording Trespass events, on the wall of the Town Hall is a commemoration of another New Mills lad, Sir Martin Doughty who did much to promote open access and produced the text for the Trespass Trail. New Mills is home to the factory that makes 'Love Hearts' and I get a whiff of boiling sugar as I head for the official walk start point. The town has a good selection of shops and all look prosperous, a little up market but still very functional. Take your time in New Mills and visit the Heritage Centre where there is a wonderful model of the town. Peer over a few walls, you will be surprised by some of the views, then walk slowly down Rock Mill Lane. Across the valley is an old mill crying out for a little love, it could be the centrepiece of the town like Salts Mill near Bradford. 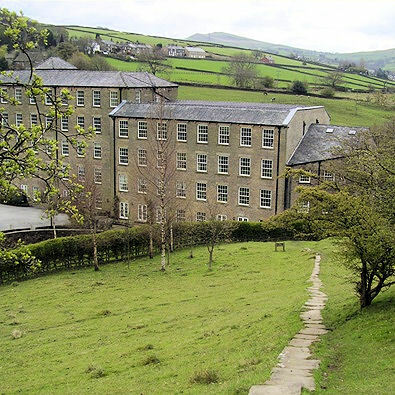 In the valley bottom are the remains of Torr Mill and towering above viaducts to carry the town roads over the ravine. Here the rivers Goyt and Sett converge and immediately cascade over a weir which once served the mill and now drives Archie. The Torrs Hydro co-operative installed the Archimedes screw in 2008 and since then it has generated 520,000kwh. A display shows it is today producing 52 kw, enough to boil 17 electric kettles. As I stood reading the information about the plant a man with a key arrived and it was nice to take a peek inside and chat about this sustainable generation scheme that hopefully does not offend anyone's eye. The Millennium Walkway was what first brought me to New Mills and I was not disappointed. It's one of the best structures built to mark the year 2000 and to my mind ranks well with the bridge over the Tyne. Having said that, the walkway would be lost without the location and I have been lucky on two visits that the river level has been high enough to offer an exciting backdrop. In addition the huge retaining wall built by the railway can't fail to impress at such close quarters. 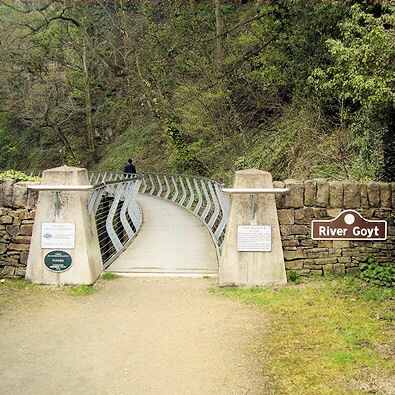 The Trail now follows the Midshires and Goyt Way through old industrial sites, or so the guide says, because they are no longer recognisable on this pleasant riverside walk. Make the best of this because soon the real work starts and I am stopping to pack excess clothing into the rucksack. I am annoyed that I fail to spot the instruction to discover the "delightfully-unspoiled" Fox Inn, but then it's far too early for it to be open on a Tuesday. 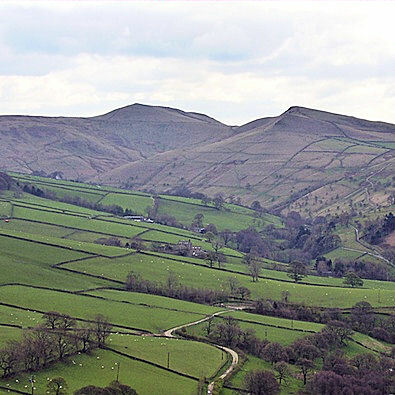 The route of the trail appears to be mostly on tracks or quiet roads so here on tarmac there is ample opportunity to take in the views without fear of tripping over the lumps of gritstone that provide a surface to other paths. 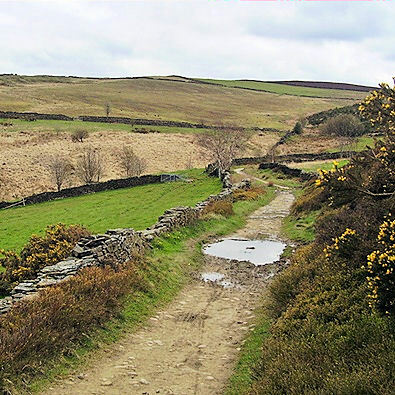 Many of the tracks are Byways and it would appear that Derbyshire were slow to review their Roads used as Public Paths and have taken advantage of the automatic reclassification to Restricted Byway. I have a slight problem with this removal of vehicle rights. Don't get me wrong I don't like motorbikes and four by fours ploughing up the green lanes and disturbing my walk with noise but I do feel that the blanket removal of rights is a dangerous legal prescient and was an easy option of recalcitrant highway authorities. I wonder what will happen in 2026 when the highway authorities have a huge stack of claims for unrecorded paths, will they suddenly all be added to the map leaving disgruntled landowners to fight for their removal? I said it was a walk to stimulate thought but now back to the scenery. Children's Inn looked more like a private house. Search the web. It's a bunk house for the Girl Guides and has been since 1933 but had been used for children from Manchester to have short holidays since 1926 hence the attraction for the Trespasses to meet in this area perhaps. I often get that feeling, I have been here before, approaching The Little Mill Inn at Rowarth I had that premonition. The road ends here and it could also be the end of the road for the Little Mill Inn which is up for sale and sounds a snip at £795,000 but it's looking a little tired. The mill wheel is stationary and the Pullman carriage is faded and a notice on the door advises that there is no service until 5pm today, sorry. It's clearly been a gold mine with acres of decking covered in picnic tables aligned to view a huge outdoor screen. The old mill is falsely named as the place is massive as I vaguely recall from our previous visit, it was difficult to locate the bar in the rambling inn. My options for a lunchtime pint are fading fast. 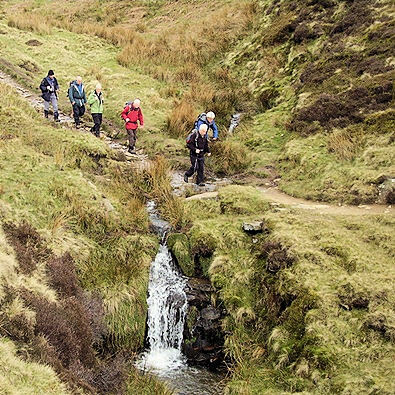 A staggering choice of six paths meet near Blackshaw Farm. "Keep close to the wall on your left" would be an helpful instruction unless you want to make a short but steep detour to the top of Lantern Pike. I gave it a miss this time but would recommend it if you haven't been up there before. 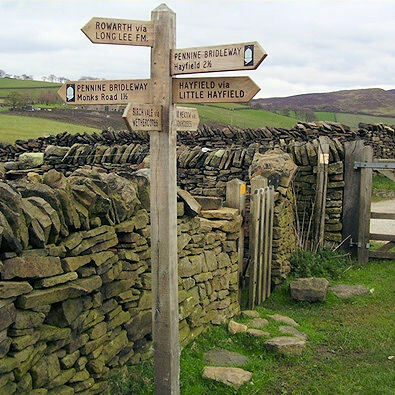 The flagged gritstone path down to Little Hayfield Mill is striking set in the fresh green grass. What a location, could I afford to retire here I wonder? A public notice attracts my attention and I learn that an application to add a path from the mill yard to the lane has been submitted. This will make a more direct route to my next port of call. The Lantern Pike Inn was placed just right. It was 12.30. Had I started from New Mills I'd have arrived too early. The barman was on his own watching the blow by blow account of James Murdock giving evidence (being evasive) to the Leveson Inquiry. Bit like watching paint dry, I am happy to wait for the quick dry summary. The beer was good and welcome and I took the opportunity in an empty bar to inspect the memorabilia on the walls. Coronation Street featured strongly and I was intrigued to know why. 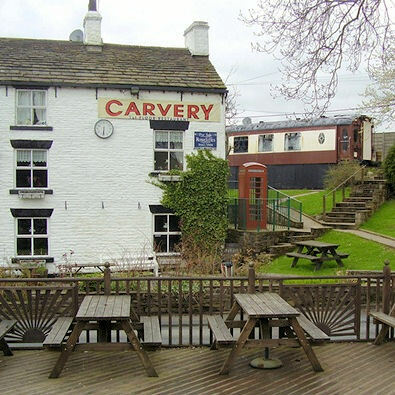 Pictures of the original cast were accompanied by a letter from Tony Warren, the shows creator, which said the format had come to him while sitting in this very pub, so now you know. When it was time to leave the barman asked which way I was heading and I said up the hill, mentioning a swimming pool that was described in the guide. You won't see that he said. What if I were to trespass a little I asked? Then take the gate by the bus shelter and walk away from the road. This is not right to roam land so I can only pass on hear say and web information about the pool which was used until the 1960's and drew bus loads from the likes of Manchester. Now a sad but evocative place it must once have offered a Greek or Roman style opulent day out, although being fed by water from the moors perhaps I take the comparison a bit too far. The pool is now home to large carp, or so I am told. Finally the real walk starts and I am making my way onto Kinder along perhaps the least used path to the plateau. I recall difficulty trying to find this path from the other end and today the heather still brushes against my legs along the narrow track. 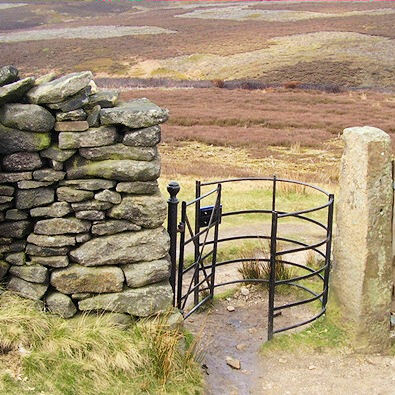 I hit the main drag from Hayfield by a charming restored kissing gate, originally installed by The Peak District and Northern Counties Footpath Preservation Society when the path was dedicated in 1897 and restored in 2008 in a project sponsored by the Hayfield Civic Trust, well done. Time for another rant? There are too many kissing gates where the space to stand and swing the gate is tooooooo! small, these gates of 1897 should be the British Standard. There, I feel better for that. The shooting cabin would not be out of place as a beach hut and is certainly a distinctive marker point up here. Who carries the coal up I wonder? 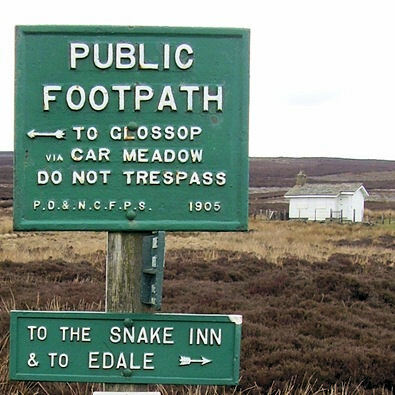 Close by a familiar green sign warns "Do not Trespass" an indication of the policy of the Peak and Northern Footpaths Society in 1905. The view down on to Kinder Reservoir is pretty dramatic, a real live Google view with all detail laid out to study and today there is plenty of water down the overflow channel. I note from the actual track I followed up William Clough that the path does not follow the Definitive line and I wonder if there is a walked track a little higher up the valley. Not that I want to use it as the cascading water is a sight and sound I love even though I struggle at stepping stones anticipating my boot with slip from the wet rounded stones. Reaching the point where the trespassers left the path I find a level rock and stop for another meal break. 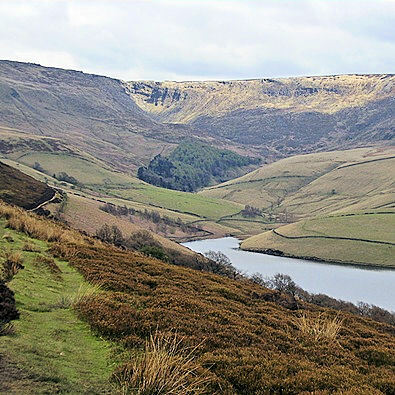 I have decided I am not up to a scramble up the steep clough side to view a piece of moor much like any other. Much as I appreciate where the trespassers got us I am a little uneasy about the true intentions of those who took part. Sitting here, had I been walking along a path where I had a right to be and spied keepers on the forbidden moor I might have walked to the summit and hoped they had gone away so that I could wander among their grouse unmolested. They were out for confrontation by leaving the path and I wonder what other campaigns some of the participants were engaged in. It was a busy day with folk passing by all the time while I sat. I wondered how many were there for the anniversary or were even aware of this being a special day for those who enjoy the freedom to wander on open moorland. There was still a little snow just above where I sat and with no purpose to reach the summit I started on the home stretch and it was downhill all the way. The final point of interest was the disused quarry where the trespass started and where today many ramblers park their car before making a similar walk with no fear of apprehension. 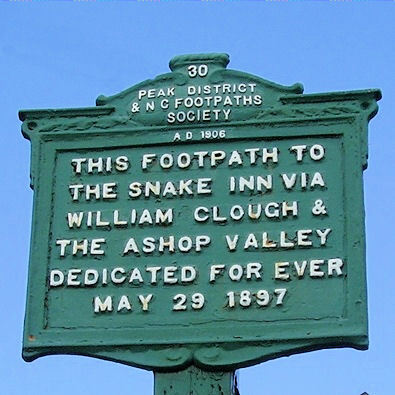 The Peak and Northern sign marking the start of the Snake Path was strangely not the first they erected but number thirty, the first having been erected opposite Carr Meadow Farm on the A624 between Hayfield and Glossop. Further along Kinder Road another plaque tells me that Arthur Lowe was born in Hayfield. He was President of the Hayfield Cricket Club and assisted the purchase of the ground in 1976 which is located conveniently next to the Royal Hotel where I ended my walk.